We here at Aleheads have been known to expound at some length on the myriad joys of Dann Paquette’s outstanding Pretty Things Beer and Ale Project. With apologies to Cormac McCarthy, a shot for the common man it is not. 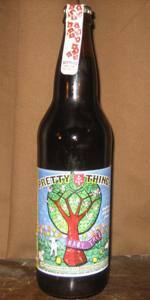 Pretty Things produces a small collection of seriously quirky brews inspired by times, people, places, and ingredients. The result is existential, daring, and completely transcendent. Paquette eschews the boundaries of both traditional brewing as well as the too-often exaggerated zeal of the contemporary haute beer movement. Inspiration alone comprises the foundation of the Pretty Things enterprise and, in turn, proves itself inspirational. 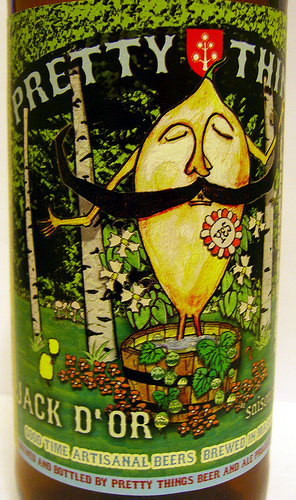 Babayaga American Stout? Outstanding. February 27th, 1832 Mile Ale? Sublime. Paquette’s brews are too curious, too mysterious, too compelling to be left on a stockroom shelf. It was with this sense of wide eyed obsessive compulsion that the Baron tucked into a Pretty Things trilogy and, in so sipping, rediscovered the soul of beer. Saint Botolph’s Town – Rustic Dark (English Brown) Ale: A Yorkshire-inspired brew named in honor of the Baron’s home and native land – Botolph’s Stone, MA. The ale is formulated with the malts of Thomas Fawcett & Sons and First Gold hops, chaptalized with four types of sugar, bestowed with malted oats and Torrefied wheat, fermented in open squares using two types of yeast, both German and Belgian, and finished with a sense of purpose that we’ve come to both love and expect from Pretty Things. St. B’s poured mahogany dark and olive oil smooth with a creamy latte head that endured throughout. A bold nutty roast aroma wafted from the glass carrying hints of earth, toast, and caramel. Smoky on the palate with appealing subtle notes of nuts and hops. At 5.9% ABV, I could once again have enjoyed the 4 hop-worthy effort for hours, but a last treat awaited. Baby Tree – Quadruple; Prima Melior: Inspired by an unusual and thoroughly unsettling tree in Sexhow, a medieval hamlet in North Yorkshire, this nod to Abbot Ales is characterized by nothing quite so much as 40lbs of dried California plums that are tossed into the kettle during the brewing process. The 9%ABV monster of a libation poured a deep, grape-mahogany with a creamy tan head that yielded to unbelievable, sticky lacing as I tipped the glass to my lips. Vanilla, yeast, and deep, dark, dried fruits wafted from the surface while a surprisingly complex symphony of flavor revealed itself on the pull. Huge, sweet notes of fig, raisin, and, of course, plum prevailed with hints of candy brooding on the finish. I sipped the beast slowly, enjoying its transformation as it warmed. 4-hops, once again, and a glass raised to a truly epic brewer. If there is one complaint to be levied against our friends in Cambridge, it’s that their brews are too delicious to be so frequently unavailable. I stopped by my local ale shop, Charles Street Liquors, yesterday for a weekly perusal of their offerings and happened into a lamentation with the proprietor. To wit: “The beers are so consistently perfect, but we’re rarely allocated more than a case or two.” “Did you manage to try the February 27, 1832 Mild,” I inquired? “I was on vacation that week,” he responded piteously. We stood for a long moment pondering the grief of a Pretty Things Ale lost and I departed thankful that I’d been lucky enough to enjoy the much sought-after offering. Yet, maybe its occasional rarity is part of the charm. I certainly cannot and will not begrudge the pursuit and realization of greatness, even if it sometimes produces quantities too small for me to take part. Thanks, Dann, for sharing your ales with a humbled and impressed band of brothers. We can’t wait to see what you do next. Posted in Tasting Notes.Tagged 1832, Babayaga, Baby Tree, Boston, Cambridge, Charles Street Liquors, Dann Paquette, February 27, Jack D'Or, Pretty Things, Saint Botolph's Town. When are you and Dann Paquette getting married? Will the other Aleheads be invited? I can’t wait to douse you in Baby Tree as you drive off to Vermont for your honeymoon. Better make it Jack D’Or. I wouldn’t want you to get Baby Tree all over your pretty bridesmaid’s dress. Whatever. I’m never going to wear that thing again anyways. It makes me look drunk.